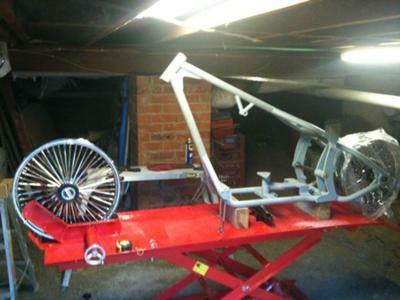 Here are some photos of my softail chopper project that I have started the 1st of April 2010. Your bike building DVD helped me to get my bike to this stage, not finished yet but not long to go. Hi I ame from SA (ZA). 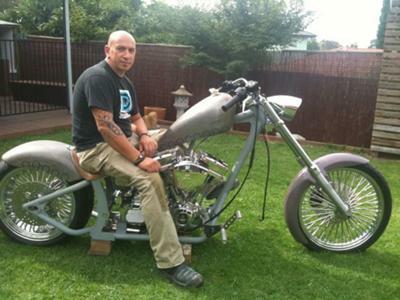 I also want to build my V8 chopper and other bikes (bobers and choppers). It is my dream to build them. Starting on the V8 4ooo lexus. I would also love some input from anyone, for it is my first build I would also put my build progress on the website. I want to build v 8 motorcycle. I just need some ideas on getting started. I have a 410 rodeck aluimn engine dynoed 7200rpm 700hp-580fpt on methanol. I would appreciate your input. and the tank as well. Personally I dont like the front light but the rest is pretty good!! 5 stars for the frame! Great build! Can you provide details on the build? Frame, engine, etc. ?